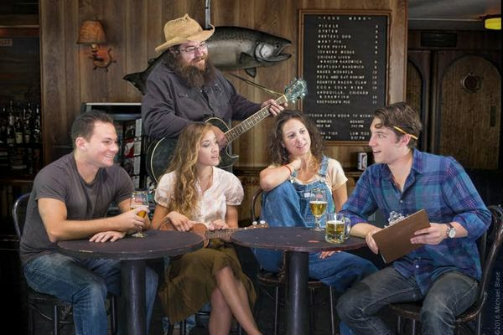 Nick McGuiness, Mary Adams, Matthew Angel, Andy Striph, and Megan Griffin in The Folk Singer. BOTTOM LINE: The Folk Singer provides the experience of a concert while giving a spotlight to social and cultural issues. More of a ninety-minute concert than a musical, The Folk Singer showcases the musical talents of a group of West Virginia natives determined to make folk music. The piece opens in a West Virginia neighborhood bar owned by Frank (Larry Fleischman). Fleischman’s performance grounds the show in a sense of reality as he creates a hilarious portrayal of "everyone’s favorite bartender." In this bar young musician Doc Riverton (Andy Striph), determined to showcase his folk music talents, tells his girlfriend Kim Walsh (Micha Lazare) of his plan to put on a folk concert. After short deliberation, Doc's band of neighborhood musicians—Todd Ramsey (Matthew Angel), Amy Worth (May Adams), Zack Roberts (Nick McGuiness), and Brittany James (Olivia Griffin)—begins the folk festival: a set of folk songs with transitional sketches dealing with war, social issues, and the world's neglect of folk music. The scenic and technical design is extremely creative. A realistic bar set reverses to reveal a full band and makeshift stage that creates an authentic concert experience. Additionally, as Kim films the performances—theoretically for Doc's promotional material—the footage (actually shot live throughout the show) is broadcast behind the performers. The songs themselves tend to be hit or miss. An imbalance of plot and musical numbers makes the characters less relatable, and the songs about touchy subjects, such as nuclear warfare and abortion, difficult to stomach and justify. Additionally, the songs jump around in terms of topic, moving from a song about nuclear war to one about a newborn child, or from a comedic interlude about Abe Lincoln into a campy sketch about a Republican beach-goer refusing to save a drowning Democrat. Though it's all necessary and interesting material, the order seems a bit random and doesn’t allow for proper time to dwell on something heavy and thought-provoking. Rather than land, the songs hit with too much material too soon. That said, the performers themselves are extremely dedicated and talented. The light, bubbly voices of Griffin and Adams are soothing and upbeat, and the comedic talents of McGuiness shine with a song about the different terms used to describe “making love.” Angel is a true standout, with a powerful presence that makes his songs, typically dealing with war and terrorism, really resonate. And as Don, Striph serves as an excellent MC. The performance ends back where it all began, at the neighborhood bar, with Doc and Kim discussing the future of Doc’s music career. Though Doc’s life and struggle to make it as a folk musician are interesting to witness, The Folk Singer doesn't tie up any of the loose ends left by the concert, or even comment on the subject matter expressed by the artists. Though it's an interesting concert and an excellent introduction to a rarely publicized genre of music, as a book musical, The Folk Singer leaves something to be desired. The Folk Singer is by Tom Attea, composed by Arthur Abrams. Directed by Mark Marcante. Assistant Director is Danielle Hauser. Set Design is by Mark Marcante. Lighting Design is by Alexander Bartienieff. Sound Design is Alex Santullo. The cast is Mary Adams, Matthew Angel, Larry Fleishman, Olivia A. Griffin, Micha Lazare, Nick McGuiness, and Andy Striph.